“The new Web site was launched with two main goals in mind; help renters easily find great places to live, and build online brand recognition. The Web site needed to be easily accessible and have the ability to maintain a high-quality user experience. For this we looked to many different interactive floor-planning tools but realized quickly that there was only one company that would best support our requirements. Floorplanner.com offered a creative and unique outlook on visualizing living space online. 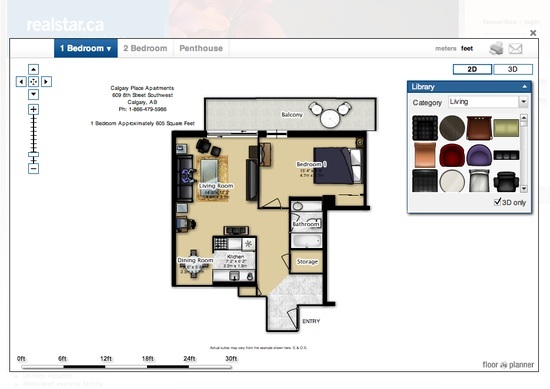 With floorplanner.com, realstar.ca users can now interact with each individual apartment, adding their own furniture, carpets, office equipment, and so on, ultimately giving shape to empty space, and designing their own home. The user experience that comes with Floorplanner gives realstar.ca an advantage over competing Web sites, which results in more online traffic, a better online experience, and returning users. With Floorplanner we can also easily create, manage and customize each floor plan when needed, the simple back-end admin portal is easy to navigate and understand, which in the end allows us to make changes quickly when needed. For more information on apartments for rent in Canada feel free to visit realstar.ca or find out more about what Floorplanner PRO can do for your site.